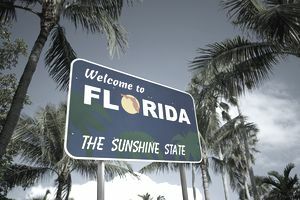 Florida doesn't have a personal income tax, an estate tax, or an inheritance tax, although it does impose sales and property taxes. The state's overall tax burden has consistently ranked among the nation's lowest for decades, according to the Tax Foundation, a non-profit and non-partisan educational and research organization. It was just 8.9 percent in 2017. The Florida constitution reserves all revenue from property taxes for local governments—the state itself doesn't use any of this money. Property taxes are based on the "just value" or market value of properties as assessed by a local appraiser on Jan. 1 of each year. Increases in value are limited to 3% of the previous year's assessment or the Consumer Price Index (CPI) in Florida, whichever is less. This limitation is known as the "Save Our Homes" cap. Taxes are based on millage rates set by local governments, with 10 mills being equal to 1%. The millage rate is multiplied by the value of the property to determine the dollar amount of property tax. County, city, and school districts are permitted to levy taxes at up to 10 mills each. Special districts, such as water management, can levy additional taxes, usually at under 2 mi;ls. Florida offers several property tax exemptions that can help reduce your tax bill if you qualify for any of them. They include a homestead exemption of up to $25,000 as of 2018, or $50,000 for married taxpayers. Exemptions are also available for senior citizens over age 65 and the disabled. Veterans can qualify for four different types of exemptions, and widows and widowers are entitled to a $500 exemption provided they haven't remarried and weren't divorced at the time of the ex-spouse's death. Homeowners who are legally blind are also entitled to a $500 exemption. Florida is one of only seven states that has no personal income tax. The state tax on intangible assets such as stocks, bonds, and mutual funds was repealed in 2007, so this type of property is no longer taxed, either. Florida does impose a 5.5% corporate income tax. Florida Democrat Andrew Gillum vowed to increase this to 7.75% when he campaigned for governor in November 2018. His goal was to raise an additional $1 billion a year in revenues which would go mostly to education, but he was narrowly defeated by a .2% margin. The tax rate remains at 5.5%. There are no "death taxes" in Florida, either on the value of estates or on gifts received by beneficiaries. The Florida estate tax was repealed effective Dec. 31, 2004 and it cannot be reinstated. The state's constitution prohibits it. Florida state taxes apply to several types of purchases. A stamp tax of 70 cents per $100 of value is assessed on documents that transfer interest in Florida real estate, such as warranty deeds and quit claim deeds. A tax is also levied on notes, bonds, mortgages, liens, and other written obligations to pay that are filed or recorded in Florida. The rate for these types of contracts is 35 cents per $100 of value as of 2018. Counties are permitted to add additional fees. Florida charges a sales tax of 6%. Food, prescription drugs, and non-prescription drugs are exempt from taxation. Counties can charge their own additional sales taxes, bringing the tax rate up to 9.5% in some areas. Of Florida's 67 counties, 55 charge an additional sales tax. The Florida gas tax is actually somewhat exorbitant, offsetting some of the state's other tax breaks—at least for those who drive a lot. It's 59.76 cents a gallon as of 2018, although this figure includes a federal excise tax. Florida ranks eighth for the highest gas tax in the country. The state charges a $1.34 tax on each pack of cigarettes. There's also a surcharge for other tobacco products, excluding cigars, that's equal to 60% of the wholesale price. Still, the state ranks 33rd overall for this tax rate. Hotel tax rates vary by county. They range from 2% to 6% and this is in addition to the sales tax rate of 6%. These taxes are known as the Tourist Development Tax and are charged on hotel rooms, but rooms that are leased for more than six months are exempt. On the bright side, you can buy a flag in Florida—either the U.S. flag or that of the state—without paying any tax at all.